We're used to seeing stunning images of cascading waterfalls in all their fluid glory, but have you ever wondered how they would look if Jack Frost was let loose on them? 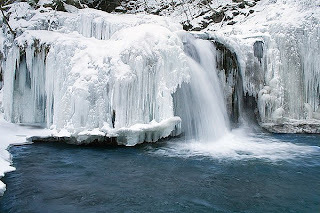 Well, you need wait no longer as we have compiled a range of fantastic frozen waterfalls. 1. This enchanting image of an ice waterfall perfectly captures the force and flow of the water underneath the ice, making it hard to comprehend how it ever manages to freeze. 2. 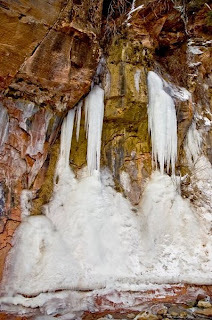 Ice climbers flock to The Fang in Vail, Colorado. 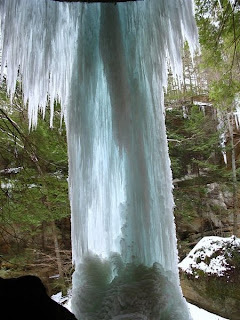 The enormous ice pillar forms from the cascading waterfall only on exceptionally cold winters, and when it does the column can measure up to 50 meters high and has been known to have a base measuring 8 meters wide. 3. 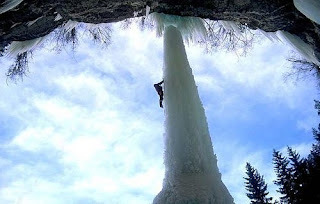 If you think climbing an ice waterfall is scary, imagine the fear factor when part of the cascade breaks off and collapses to the ground mere meters from you and your buddy. 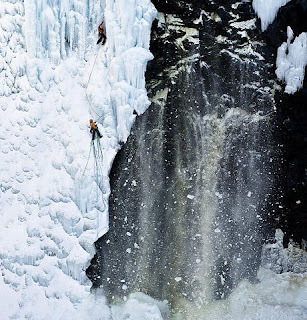 That's exactly what happened climbers Albert Leichtfried and Markus Bendler on their ascent of a frozen waterfall near Hokkaido, Japan. Their friend managed to capture the frightening moment on camera. Both climbers made it to safety soon after. 4. 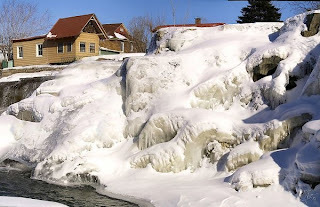 Thick layers of ice sit on St Louis Falls in Beauharnois, Quebec. The area is home to one of the largest hydroelectric generating stations in the world. 5. This fantastic shot shows the waterfall freezing from outside in; there's still a considerable waterfall flowing within the ice lume. 6. 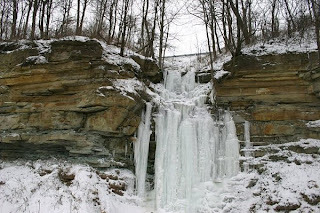 Undulating waves and nodules of ice give this waterfall in Starved Rock State Park, Illinois, such wonderful texture. 7. 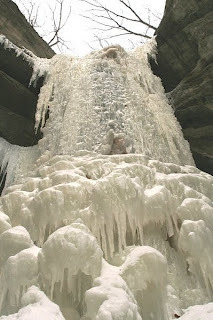 This random waterfall was discovered on the road side of a seldom travelled road near Hamilton, Canada. 8. 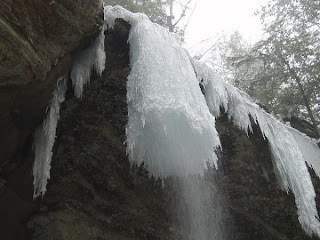 The folds at the bottom of this waterfall demonstrate how slowly waterfalls can freeze, and are in stark contrast to the jagged, spiky icicles hanging from the edge of the rock. 9. This great image was taken in Oak Creek Canyon near a place called Temple of Mother Earth on the West Fork Trail, Sedona, Arizona. 10. 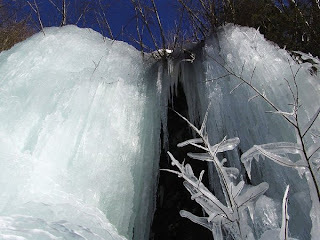 A simply fabulous shot from the bottom of the ice waterfall looking up. Just look how the ice has built up from the spray on surrounding twigs. That's what you call natural beauty.